Migrating your site to a new domain or URL structure is a huge undertaking whose SEO implications should not be taken lightly. In fact, I would say switching URLs can be one of the lowest value yet highest risk things you can do as an SEO. Sometimes, though, we have to do things that are risky for other reasons. Maybe politics is at play and you were not involved in the decision. Or maybe the UX team has made a solid case for it. Or maybe even you’ve discovered issues with your site and you know that you will not be able to rank without changing your URLs (think: URLs with parameters and mass duplication. Fun for the right SEO!). This article is for you. Or maybe you’re a business on an extremely old platform and you have set aside budget, time, and people to get it done right. 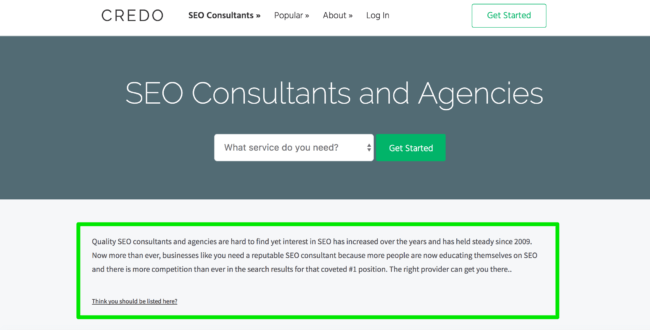 So you’re hiring an SEO agency to help your engineers (or development agency) build the right site and move the old site correctly over to your new site. First off, congratulations because you are already a number of steps ahead of most companies. Secondly, you need a basic understanding of what’s needed to migrate a site so you should keep reading to gain that base of knowledge. When migrating a website, many factors exist that must be accounted for that can either help or hurt your website’s organic traffic over the long term. The many important elements in your site’ssuch as Google Tag Manager, Google Analytics, Search Console verification, rel next/prev if you have pagination, and more. As you can tell there’s a lot here, which is why site migrations are so hard to get right. Throughout this guide we are going to try to shed some light on the tasks and strategies needed to execute a site migration and not kill your business or organic traffic in the process. When you migrate a full website, it often involves a change of the technology that the site is built on. Developers want to build on the newest coolest thing that will make the site wicked fast, content teams need more control over the content publishing and format of their work, marketing teams need different tools and integrations to increase traffic and revenue to your company. There are many good reasons to change your website’s technology during a redesign and migration. However, this adds complexity to your project. The new technology is not SEO friendly out of the box (see: AngularJS). Technology changes necessitate site structure changes, which can lead to a loss of longtail traffic. Old technologies do not play nicely for redirects, so the redirect strategy becomes a nightmare and often misses important pages with links. Splitting Googlebot traffic between old and new to make sure that Googlebot can access your new pages. This does not mean a 50/50 split, but rather unblocking some URLs on the test domain and sending Googlebot traffic there specifically with help from your system admin, and tracking rankings and conversions. You should always do a comprehensive SEO site audit on your new site with the new technology before setting it live, mostly so that you can grab any immediate low hanging fruit and also have a plan to recover traffic should you lose some in the migration. URL structure changes are an SEO’s dream and nightmare at the same time. If you’re able to move from really bad URLs (think site.com/?item=123) to really good URLs (think site.com/great-url/), you can see instant improvements in your search rankings. New users first and foremost. Customers second, or tied with first. Obviously from an SEO perspective we value search engines higher than most, but in reality I view Googlebot/Bingbot/etc as the fifth user persona. URL changes are also not as simple as just updating them to whatever you want. Different technologies handle URLs in different ways, necessitating rewrites or worse. Use URLs to show your site’s hierarchy, especially on large websites. This has been shown to help rankings. Redirects and correct 1:1 mapping of them are incredibly important especially when you change your URLs and migrate to HTTPS at the same time. This can also be quite tough to do well because many hosts and DNSs do not play together nicely. It is incredibly common to chain redirects, but the goal is to have direct hops to the final URL. Should you roll out your new URLs and have some chained redirects, you can always go back and fix those later. Resource: Will changing URLs negatively affect SEO traffic? The most important thing to take into account around site speed as you migrate your website is that new technologies come with their own issues. If you have been on a platform for a long time and it has been optimized for speed, then there is a good chance that you will lose some performance in your site migration if you do not take speed into account. This way, you will then have a record of their speeds before and after the migration. Of course, migrating and re-platforming your website is the perfect opportunity to fix current site performance issues and actually end up way ahead instead of equal to or behind where you were before. The Insights tool also works on most test servers as long as that test site is not protected by a username and password. If it is, then you should briefly remove that protection so you can gather these benchmarks and continue to fix the issues that the tool flags up before you go live. Any time you move a website, your site’s structure will inevitably change as well. Often, I see internal links changing in ways that are not expected unless you take them into account from the beginning. In our post on website architecture for SEO, we explain why site architecture matters for your search rankings and traffic especially in the long tail. If your important pages require four or more clicks from the homepage before they are reached, they’re going to have a hard time ranking well and driving traffic. Before you migrate your site, you need to map your current structure and identify problematic areas so that you can fix these when designing and building your new website. 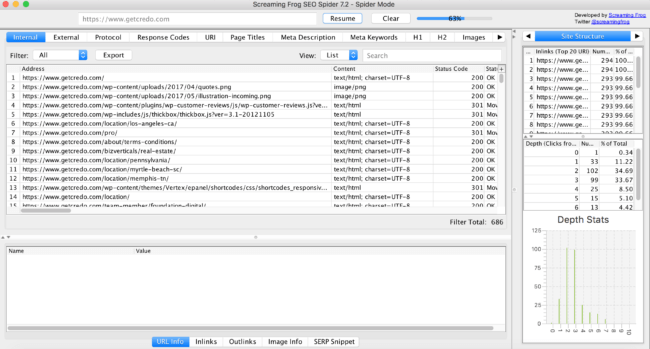 The simplest way to do this on a reasonable sized website is with the Screaming Frog SEO Spider. A license is only $190 per year, though they also offer a Free version which crawls up to 500 URLs with reduced functionality. Within the Screaming Frog crawl, you will find a Site Structure report on the right side of the screen. 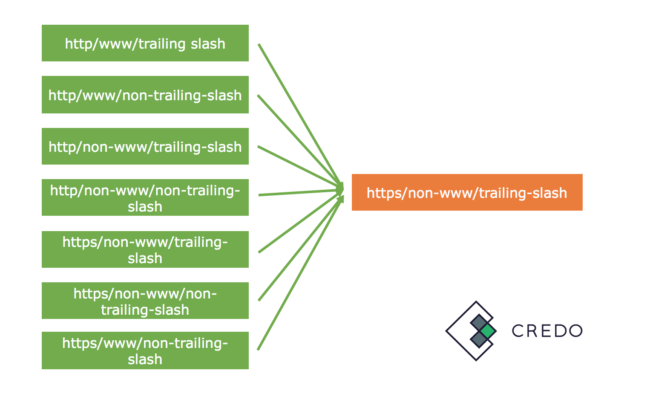 Each URL line within the crawl also tells you the level of the page, so you can identify which pages are below four clicks from the homepage and work to bring those higher in your architecture. On-page content is incredibly important to your page’s ranking ability, second only to meeting the user’s need (which also improves share-ability and thus link-ability). We wrote a post about fresh content for SEO and what it means which you should absolutely refer to when planning out your page structures and content elements. Of course, you first need to take into account what might be useful to the user and then what might be useful for conversion. Depending on your goals, such as driving people deeper to your product pages or converting them directly from the page on which they land, your content will be different. While on-page content has site speed (see section 3) implications, sometimes the tradeoff for more (and better) content on the page overpowers the speed tradeoffs, plus you can always improve your page speed by leveraging page caching and using a CDN, which are topics we will cover at another time. The number and configuration of products on your categories. Websites are composed of individual pages, but if you have a dynamic website then all of your pages are contained within page templates to allow for easier creation of pages instead of manually building each and every page that you need to launch. This has its pros and cons, especially on user-generated content sites, but generally this makes on-page optimization easier as well. I always recommend that in your pre-migration audit of your existing site, you note where your current pages are sub-optimal and then make sure to correct those issues with your new website. This is once again possible to audit within Screaming Frog, both with your existing and staging sites. You should audit both. HTML sitemaps which exist on the front end of your website to help search engines (and users) find all the pages on your website. I have too many times seen migrated websites forget to update both types of their sitemaps and thus keep submitting sitemaps with old URLs that do not return a 200 status code. Search engines have many times told us that this is suboptimal for SEO and after a while they may even stop trusting your sitemaps if they have too many errors. Other times, HTML sitemaps (here is Credo’s) can be completely lost which then results in a rankings drop which is incredibly hard to diagnose. Generate and link to the new HTML sitemap on your new website, linking to your new URLs. Sitemaps aren’t hard to get right (though they can get complicated depending on your needs, such as News or video), but they are absolutely important to your long-term organic traffic. What do you think? What did we miss? What would you add? What experiences have you had? Leave them in the comments. If you’ve had a site migration and it’s gone wrong, you should probably get an SEO site audit done. And if you’re migrating an ecommerce shop, check out our ecommerce site migration specialists. > Use URLs to show your site’s hierarchy, especially on large websites. This has been shown to help rankings. I strongly agree with this, but I’ve struggled to find data that demonstrates it. Do you have any? Like anything in SEO it’s impossible to separate it out from other changes that happen at the same time, but many have seen this. And I’ll hopefully have a case study in it very soon. Good article. Also think it’s really important to uncover any technical problems in the old site to hopefully prevent those issues in the new one. I have dealt with SEO issues in the migration of a number of websites. The reasons for why a website is to migrate to a newer domain can vary, but SEO gets killed only when the redirection of old pages is not completed properly. In a general rule, you can spare the less authority pages, but the landing pages must be properly linking to the appropriate pages of the new domain, or you will lose the authority, which will indirectly hit your SEO. Aaron – While I definitely think you are correct that redirections not being done properly can kill your SEO, I would disagree that it is the only thing that can kill a site in a migration.